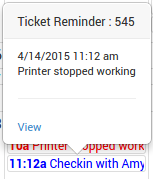 Click any event to display a quick review. Delete – Deleting an Event will permanently remove the Event system wide for all users. *Please note that non-admins do not have rights to edit or delete events created by other users. If this is the case, all options on this form will be unavailable to edit. You may make changes as necessary, then click save. 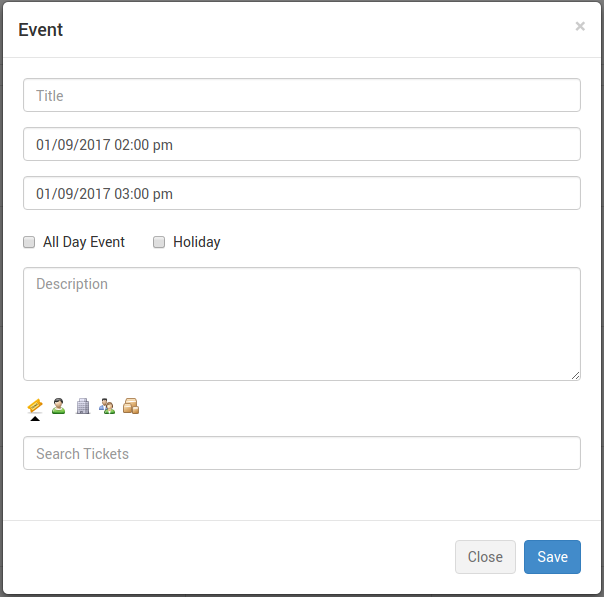 Click here to learn about making Event associations using the Association toolbar. 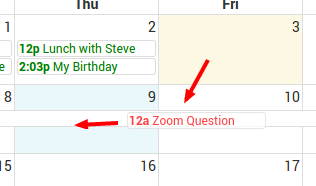 From any main Calendar view, you may Drag and Drop and event from one date/time to another. From the Month and Week views of any Calendar, you may change the duration of “All Day” events by hovering over the end of the Event. An arrow will appear that allows you to shorten or lengthen the Event duration. From the Week and Day view of any Calendar, you may shorten or lengthen dates with start and end times by using the pull bar at the bottom of the Event. An arrow will appear that allows you to shorten or lengthen the Event duration.